Create a BABY book full of fun embellishments! Why not create a photo book full of photos from your baby’s first year? We have lots of fantastic embellishments to make your photo book extra fun, and remember those special memories. All featured embellishments can be found in the BABY folder. We’ve chosen some of our favourite embellishments to share with you! 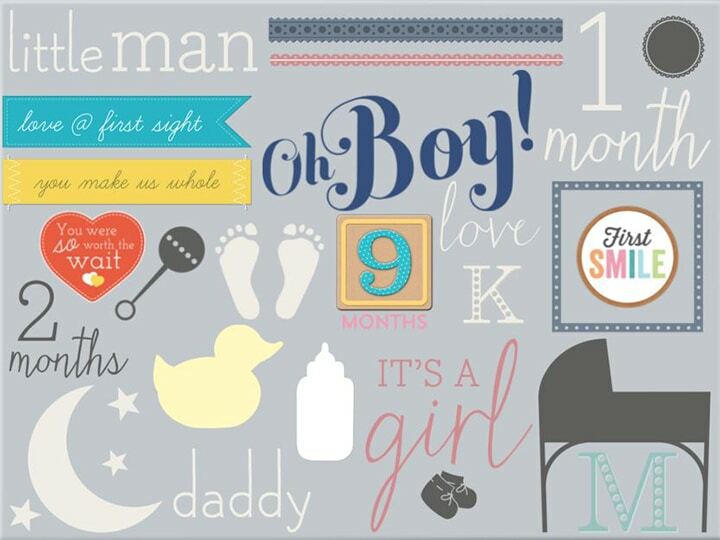 The BABY embellishments vary from colourful baby toys, adorable sentiments and playful text. Embellishments can help you mark special moments in the year such as, first smile, first tooth, first step. The BABY embellishments, can be found when you click on embellishments, and then ‘Baby‘. In the Baby folder there are two different categories, the ‘Hello Baby’ collection and ‘Baby’. The embellishments we have used are a mixture of both. To try and inspire your inner creativity, we’re sharing different ways that we think you could use your embellishments through out your book! Have fun creating your own baby book, share your ideas to help inspire others! Tagged as baby book, baby embellishments, first year, Snapfish IE, Snapfish IE blog.